Vanessa Markert shoots a layup for Bradley. The junior finished with a team-high 19 points in the win. Peoria, IL - College basketball was officially back Friday night in Peoria as the Bradley Braves (1-0) hosted the Omaha Mavericks (0-1). Things got off to a slow start, as the two teams only combined for 10 made shots in the first quarter. A layup by Shunseere Kent (Jr. - East Point, GA) put the Braves ahead 8-6 early, forcing the Mavericks to call a timeout. Omaha then got things going with an 8-0 run, capped off by a Jess Walter shot to take a 14-8 lead over Bradley. Some Bradley free throws from Danielle Brewer (Sr. - Coatesville, IN) made the score 14-11 in favor of Omaha, wrapping up the first quarter. Although the chances were there, neither team could make an 8-0 run similar to Omaha's in the opening frame. Each side would trade the occasional shot, with some free throws as well, but Bradley would wind up going into the halftime locker room with a 23-22 lead. At the half, Braves Head Coach Andrea Gorski was pleased with her team's defensive efforts in the first 20 minutes, while also citing that she had some concerns in that regard headed into Friday's game. Bradley came out in the third quarter firing on all cylinders. The Braves had quality looks coming from Vanessa Markert, who scored 10 of her team-leading 19 points in that quarter. The Braves were able to shoot 10-15 from the field. Markert says that while things didn't start off well, she knew what she had to do to begin the second half. "We weren't capitalizing on the other team's weaknesses. We didn't have a really strong inside presence. I knew that I really needed to be active in the third quarter." Coach Gorksi also praised the improved guard play to start the last 20 minutes. "I thought our guards did a better job of closing the games in that second half and not being so stagnant." The Braves rode that improved guard play and Markert's shooting to take a 12-point lead with just one quarter remaining in the game. 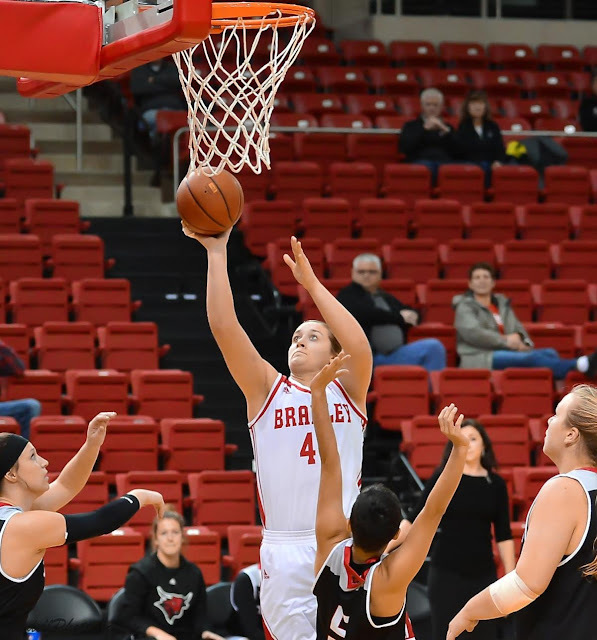 The Mavericks had their best quarter in the fourth quarter, shooting 6-15 from the field, and a perfect 6-6 from the free throw line, but the Braves did well enough that they were able to counteract the improved offense of Omaha, shooting almost 70 percent from the field. Foul trouble was a factor, as both Brewer and Chelsea Brackmann (So. - New Berlin, WI) would both finish the game with four fouls. Gabi Haack (Fr. - Elk River, MN) was good at the free throw line, finishing with a team-best 4 for 6. In the end, the Braves came out on top, 69-56. After the game, Markert thought things looked good beforehand, but they didn't start as expected. "We were well prepared, we just didn't take the initiative enough to capitalize." Gorski added that there is undoubtedly an improvement on the way in the future games. "We weren't hitting the outside shots. I think we're a better shooting team than we showed tonight." The Braves will wrap up a two-game home stand with Lincoln (Missouri) next Wednesday, November 15, tipping off at 7:00 pm from Renaissance Coliseum.